It’s been said that the medium is the message, but how much say do we have over which mediums shape our experiences—and how might they shape our education? Meghan Parker, an art teacher at a public high school in North Vancouver, considers this question in her recent thesis, “Art teacher in process: An illustrated exploration of art, education and what matters”—a 268-page comic book created for her master’s in arts education at Simon Fraser University. Challenging conceptions that scholarship should be textual—“12-point font, Times New Roman,” as Parker puts it—her work demonstrates how scholarship can be artful and that art can be scholarly. The thesis is structured into chapters titled after the seven elements of art—line, colour, form, texture, shape, space, and value—which act as real-life metaphors for Parker’s inquiries. Together, the elements converge to form a site of praxis, where the theories and thinkers Parker engages with are in direct conversation with reflections and questions toward her own methods as an art teacher. Parker anchors this praxis by illustrating herself as narrator, taking us on a journey à la Magic School Bus across scenes from her daily classroom experiences, while also integrating quotes from theorizers she is influenced by, self-reflexive musings, and scenes from her home life. The combination of visuals and text in comic-book form allowed her to depict how scholarship, teaching, learning, life, and art are all interwoven practices. 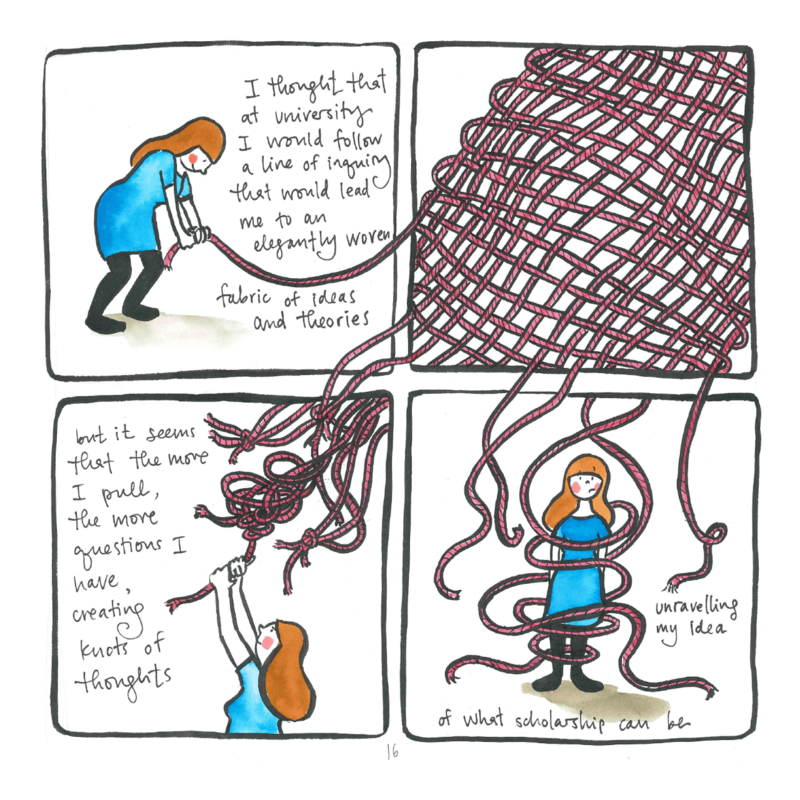 Creating an autobiographical comic also enabled Parker to insert her own body within her scholarship, illustrating how knowledge is deeply embodied—something our educational system often tends to forget.